Concrete surfaces play a central role in institutional and commercial facilities, from creating a first impression for visitors to providing safe, reliable surfaces for walking to and around buildings. The challenge for maintenance and engineering managers is ensuring the safe condition of these surfaces to prevent potential costly problems, including slips and falls and premature replacement. As these products evolve, managers who specify hardscape coatings need to understand what works best for their substrates because their product options are expanding. 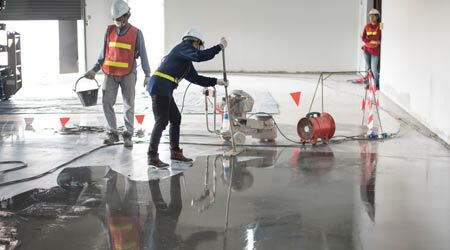 With as many choices as that have in today’s market, in order for managers to specify the most effective coating for a concrete project, they first need to understand important changes in the latest generation of coatings. In addition to improved strength and sustainability, the latest concrete coatings also feature a technology that might be familiar to many managers. “Most of the positive changes (in coatings technology) have been in cure times,” says Scott Thome with Niagara Machine. “When evaluating a protective coating system, the cure rate needs to be considered. We are seeing the use of an old but proven technology brought into the field. Whether a manager prefers a decorative coating, a protective coating or a combination depends on the setting and application. “If something decorative is what you’re looking for, then you’re probably talking about foot traffic or light use of a forklift,” Elliot says. “Absolutely you can get beautiful decorative finishes that will protect against that kind of use, and you don’t have to sacrifice decoration for protection.